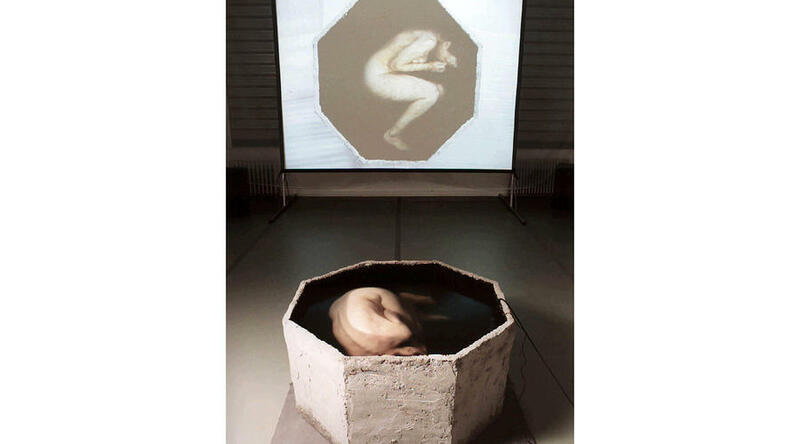 Cast-concrete vessel, water, 6-hour immersion, projected video, sound. Water is a fundamental aesthetic and technical element from the first human artistic productions to this day. The evolution of contemporary art and culture throughout the twentieth century have placed this substance in a particularly privileged place for the formal and visual experimentation. But why do artists have this renewed interest in water in recent decades? 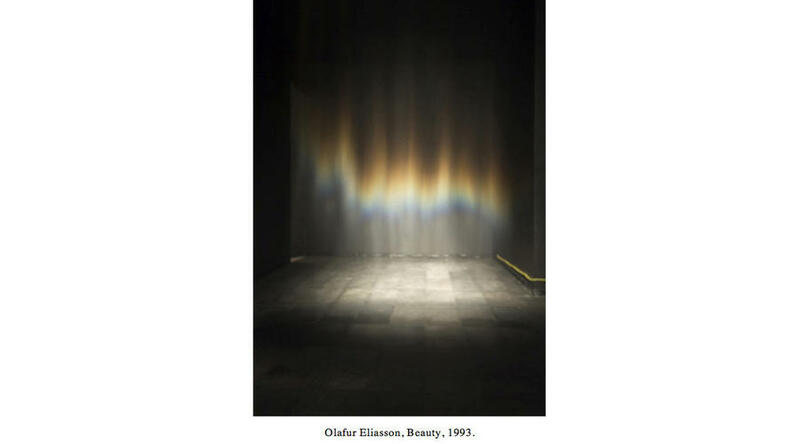 ©Olafur Eliasson 2013. Courtesy the artist. Facing the modernization and demoralization of the modern world, the water seems to provide an elementary way to see the world again, to physically feel it, to approximate the timing of everything around us. The therapeutic and healing nature of this substance, recognized in all cultures and religions, not only connects current citizens with basic needs and cleanliness, but invites them into a spiritual, emotional, intellectual exploration, of the rich ludic, symbolic and cultural heritage accumulated over the centuries. Installation - performance. Diapason Gallery, New York. ©Monika Weiss 2013. Courtesy the artist. Designers, architects, scientists, engineers and artists are sharing their fascination with structure, its movement and its properties. The figure of Leonardo da Vinci seems to re-emerge today through the growing number of collaborative projects with development challenge the fragmented structure of knowledge in Western culture. In this sense, the water flow itself and the interconnectedness of its different states on the planet seem to be the best visual metaphor of human thought and the global convergence of knowledge. 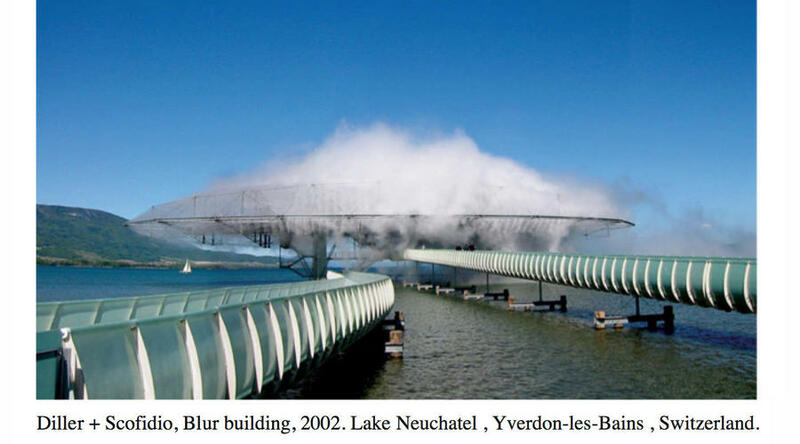 Diller + Scofidio, Blur building, 2002. Lake Neuchatel , Yverdon-les-Bains , Switzerland. But if the water has become one of the main topics that reflect contemporary artists is largely due to its intrinsic link with life and death. Since the 1960s the ecology has brought ethical and political content to a wide range of artworks based on water issues, which from its context wanted to draw attention to the inequalities in the distribution system and the environmental crisis affecting this common good, providing avenues for discussion or reflection and in some cases practical solutions. 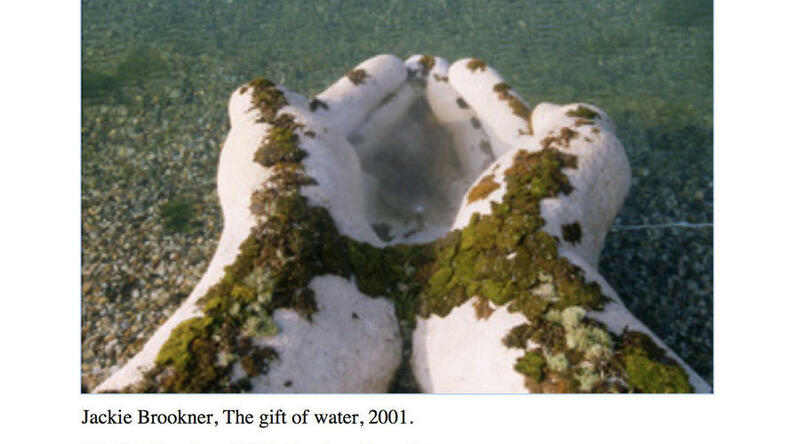 Jackie Brookner, The gift of water, 2001. ©Jackie Brookner 2013. Courtesy the artist. Hans Haacke, Ana Mendieta, Joseph Beuys, Pier Paolo Calzolari, Betsy Damon, The Harrisons, Gyula Kosice, Pino Pascali, Fabrizio Plessi, Klaus Rinke, Bill Viola and Robert Smithson are just some of the artists who have worked and are working with this medium. His works are an important means of social unrest and awareness of public opinion, while contributing decisively to enrich and update our "culture of water". "It is manifested in various forms: as hailstones, snowflake, block of ice, fog, cloud, drop, stream, river, ocean. It is an element, a basic compound and a simple formula of complex dimensions. It comes as a mirror, swirl, wave, flood. It rises and falls, and evaporates. If you try to confine its winding movements, it tends to break down barriers. [...] We feel its pulse within us. It is the elixir of life and a virtual synonym for it. Excess or absence provides a quick death or slow death from thirst. Without water we could not find the voice, the sound, the tongue would stick to the palates. Dry eyes also fall, inelastic and dull in their cavities; We see the world through areas of water "[i]. MOÑIVAS MAYOR, Esther . 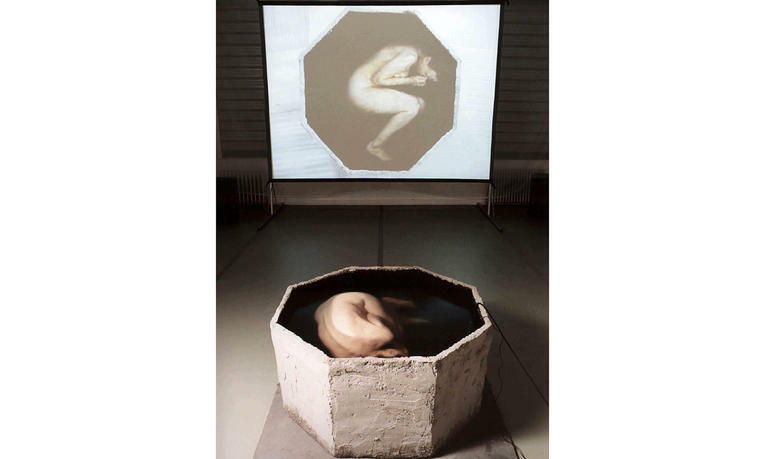 Water presences in contemporary art . A perspective from the semantic material. [Unpublished doctoral dissertation]. Madrid, Universidad Complutense de Madrid, 2011.